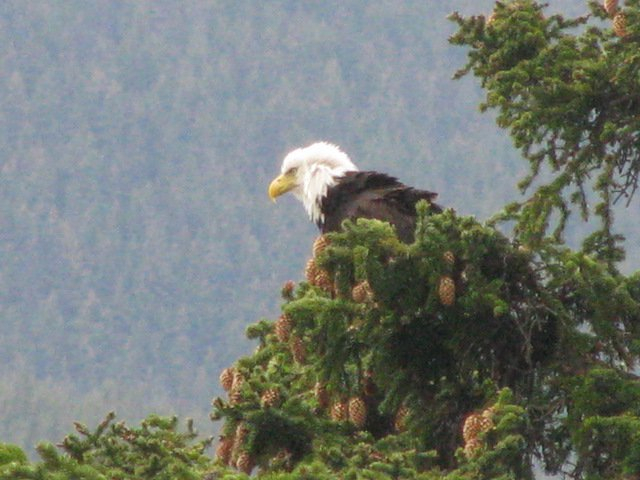 When Linda and I went to Alaska earlier this year we wanted to see bald eagles. Alaska is supposed to have one of the highest concentration of bald eagles anywhere, so we figured this would be a lock. And we saw bald eagles. Not throngs of them sitting on a river bank, but more like one here and one there. The ones we did see were amazing, and it meant even more to us when we would happen to see one because it was special. We lingered, we watched, we took pictures… We remember. I’m not saying that seeing a whole gaggle of eagles wouldn’t have been cool, but the limited nature of our sightings make each sighting unique and memorable. Unfortunately, I think too many people are afraid to share their own uniqueness, especially in the business world, for fear of being left out or left behind. Maybe it’s a lesson we learned on the playground. Kids who are different get picked last for kickball, or just plain picked on. So we conform. “Conform or be cast out” is a lyric by Rush from their song Subdivisions, which is about how tough is to be different growing up. The problem with that lesson is that it doesn’t really work later in life. I think the more we conform and follow a path just because everyone else does, the more we lose who we really are. Now, if that path is really what you want to do – go for it – full steam ahead. Make the best of it! If you recognize that it’s not, stop. Here’s how this can play out. I had a gentleman in my class the other day who has only been with his current company for about 1 month. He has a boatload of experience in the industry, and was asking about how to move up. In class we were exploring various communication and behavioral styles with the DiSC profile, and he asked if he should change his style to be more like the current leadership. If you have read this entire post, I’ll bet you know what my answer was. I said I understood his desire to fit in and be accepted, but I said it’s more important for you to be honest with yourself and true to who you are. Show you can get results, show that you have your own valid voice and be someone who can make a positive difference. In my opinion, that will make more of an impression than being a clone of the current establishment. Of course I’m not saying this is easy. If you have been through this same thing, leave a comment below and let us know what you did to succeed! Besides being a self proclaimed happenin’ dude, who is Cole Lindbergh? He is the one-and-only Games Manager at Worlds of Fun in Kansas City, MO. About a month ago, he was featured on the radio show, This American Life, which he says, “all started with a tweet.” They were looking for people in the amusement industry to profile, and Cole volunteered in under 140 characters. It’s a great feature, and it certainly made me nostalgic for the many years I spent at seasonal amusement parks. What I thought was especially fascinating was the positive impact Cole was having on his employees. In a time when so many leaders are complaining about lazy kids with no work ethic, Cole gets his employees to work really hard and have fun doing it. I had to know how he did and what made him tick, so I contacted him to see if he wouldn’t mind answering a few questions about his approach to leadership. Not only did he say yes, but he took the time to shoot and edit this video. While Cole gives you insight into what he does, I think his success stems even more from who he is. To me that means you can have the wrong people doing the right things, and they’ll still fall short. Cole is clearly the right person doing the right things. One of my favorite things Cole said (besides “hammer time”) was that we need to “always keep them motivated, always keep them happy, because that will 100% effect the sale.” You could substitute many words for the word “sale” – service, efficiency, safety, productivity, quality… all the important stuff we need our employees to do. I think one of Cole’s strategies for keeping people motivated is finding the right people for his department in the first place. He needs outgoing people who are not afraid of a microphone, so that’s who he looks for. I am sure cash handling experience is important, but it can also be taught. To treat total strangers as if they are long-lost friend takes desire and love of interacting with people. Not everyone has that. I don’t know that we often talk about being loyal TO our employees, it’s usually about them being loyal to us. But isn’t loyalty as much of a two-way street as communication, trust and respect? What are you doing to show your employees that you are loyal to them? I would love to hear your thoughts on loyalty and leadership. Add your 2 cents by leaving a comment below. For more from Cole, be sure to check out his other videos here. You’ll be glad you did! Thank you, Cole, for taking the time to share and inspire!